"I accept direction from one person...under protest." George Orson Welles (May 6, 1915 – October 10, 1985) was born in 1915 in Kenosha, Wisconsin and immediately began directing Shakespeare. The product of what used to be called a "broken home" he was raised by a family friend, spent a great deal of time in private schools, and once ran away from home at age ten with the daughter of his guardian to be found with her days later singing and dancing on a street corner. His alcoholic father died when he was fifteen, gaining a small inheritance which he used to travel to Europe where he lied about his credentials and began acting professionally. Returning to America he made a living as a radio actor, married an actress, fathered a child, and was chosen by John Houseman to perform for the Federal Theatre Project. Then he had his twentieth birthday. His sensational FTP production of Macbeth went on tour following its New York run, visiting Cleveland in Fall, 1936. Much was made in the press when he recast the title role. Though Welles had bonded with former lead Jack Carter, the actor's drinking made sending him around the country a non-issue, and Maurice Ellis was given the role. 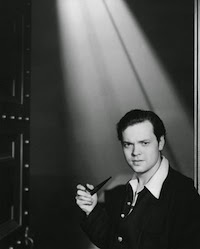 In Indianapolis, Evans was too ill to go on and Welles flew out to assume the role in blackface. The Cleveland performance must have been in the Carter Theatre (the address in the News was East 9th & Prospect in the "Federal Theatre") just prior to the run of It Can't Happen Here.